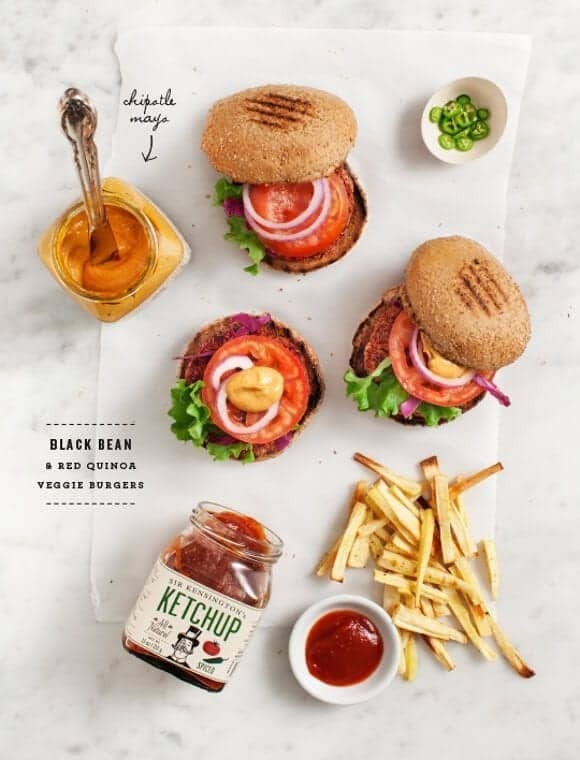 This vegan black bean burger recipe is one of our favorite dinners! With a hearty texture, these burgers are satisfying without any meat. I’m not sure where to begin with this black bean burger. 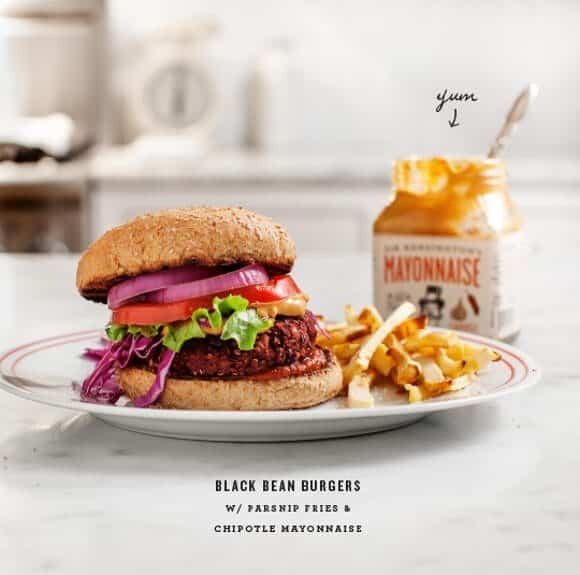 I can’t decide if I’m more excited to tell you about this vegan black bean burger recipe that I’ve been working on for quite some time, or if I should start by talking about this to-die-for chipotle mayo. I could also go on and on about the typography on that (spiced!) ketchup bottle. There are a lot of drool-worthy things are happening for me here. Ok, twist my arm, I’ll start with the ketchup bottle. (I mean how cute is that! )… Beyond the sans-serif, Sir Kensington’s ketchup is also sans-additives, stabilizers and other artificial ingredients… it’s made from real tomatoes (not concentrate), and it just tastes fresh. (Jack hates ketchup and he loved this). It also has less sugar, which is good for me because I easily use twice as much ketchup as any normal person. I set some strict veggie burger criteria for this black bean burger recipe: no eggs, no cheese, no oats. I really wanted to make this vegan so everyone could enjoy. I didn’t want to use oats because I feel like they make for gummy burgers, and I wanted a better texture and a little more protein. Black beans & flax make it cohesive while walnuts create a nice bite, and quinoa makes it a little crisp around the edges. I also encourage you to slather your burger with chipotle mayo or this chipotle sauce (this recipe also includes a vegan version!). That is… if it makes it to your black bean burger. This stuff is so good you’ll most likely want to lick it straight off the knife. I love to serve this burger with crispy baked sweet potato fries. And if you like this black bean burger recipe, find more here and here! This vegan black bean burger recipe is tangy, nicely spiced, and full of satisfying texture from walnuts and quinoa. A hit with vegans and non-vegans alike! Preheat oven to 375 with a metal baking sheet inside. In a small bowl, stir flax & water together and set aside. Heat oil in a medium skillet. Add the shallot, garlic, a few good pinches of salt and pepper and cook for a few minutes until translucent. Add the dried spices, stir, and cook for 30 seconds more. Add the worcestershire, balsamic, tomato paste, grated beet, walnuts and THE FIRST ½ CUP black beans. Stir and cook for another few minutes and turn heat off. Let cool slightly, then add the contents from the pan to the food processor. Add the flax egg and blend until everything is cohesive. It does not need to be perfectly smooth). Transfer mix to a bowl and stir in the remaining ½ cup of black beans (smash them a little as you stir), and ½ CUP of the quinoa. (You can taste & adjust seasonings at this point if you want to because there is no egg). Stir until this is all very cohesive then divide into 4 segments and roll into balls. Place the 4 balls on a plate and sprinkle them with the remaining ¼ cup quinoa. Gently roll them so the quinoa coats the outside of the balls, then press each in the palm of your hand to form patties. Place on parchment paper (on a plate) and chill for 20 minutes. Transfer the parchment w/ your patties onto the pre-heated baking sheet. Drizzle a little olive oil on top and bake for about 15 minutes. Flip and bake for an additional 10-12 minutes until the outside is not mushy. Let cool and serve with fixings of your choice and spiced ketchup and chipotle mayonnaise. This post is sponsored by Sir Kensington’s. These look so unreal!! I love the black bean and quinoa combo! Yum! I haven’t experimented enough with veggie burgers. Yours look superbly delicious! So beautiful, too! So great! Will have to check these out. Sensational photos and styling! Also, gotta try that burger recipe!! Ok to be honest, this looks like the best tasting quinoa burger ever !! *drools* But i am quite lazy so i’d rather someone cook it for me or eat it at some restaurant. I wish i could just grab the burger from the picture and pull it out from my screen 🙁 yummers. Thank you for making me hungry hehe. AMAZING pictures btw. What a delicious way to serve up a burger. Love it and the chipotle mayonnaise. Thanks for sharing. I’ve been thinking recently about making veggie burgers but they’re surprisingly hard to get right. I love the look of these, especially with those yummy sauces. Oh MAN. I had a beet-walnut burger years ago at Deschutes Brewery in Portland and it is the best veggie burger I’ve ever had. It was so good we went there twice during our trip out west. So you can understand why your recipe is shooting to the top of my to-cook list! Ahh these look so lovely. I’ve never had a quinoa burger – I think this may have to be my first! Oh this burger looks perfect!! I love this and that chipotle mayo looks to die for too! Oh My Goodness – how I love that Sir Kensington brand of ketchup! I had it for the first time this summer in NYC visiting my daughter at school and fell hard! And guess what was in my Christmas stocking this year . . . the ketchup. I was thrilled! I had no idea they made other goodies too! Thanks for letting me know. How exciting! And, of course, this burger looks seriously good! You do everything so well! Oh my heavens. I love love love these burgers!! Looks delicious! I might have to try this. i LOVE your photographs! such an inspiration. these look amazing! now i need to get a food processor, it’s been on my mind. any suggestions on size and brand!? I use a 4 Cuisinart (this one: http://www.cuisinart.com/products/food_processors/dlc-4chb.html). I use it all the time because it’s small and convenient and not too much of a mess. I usually make small batches of things so it works for me (there are just 2 of us). I’m new to this blog (love it! ), so excuse me if you have posted about this before, but do you make your own GF buns or recommend a store-bought brand? Thanks! Thanks & welcome! I don’t make my own… pictured are actually whole wheat (not gluten free) buns from the Rudi’s brand. They make gluten-free ones as well, as does the Udi’s brand. I’ve gotten both at Whole Foods (and other organic grocery stores). Ummm, I LOVE those condiment jars!! Oh my goodness. 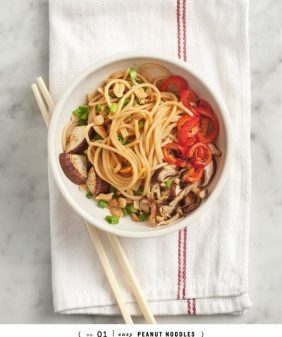 Plus, this recipe obviously looks amazing. That first photo is one of my all time favorites on L&L. You guys are just so dang inspiring and bursting with talent. I made these for lunch today. They were as delicious as the pictures look. I will definitely make them again! Lucky me, I discovered your blog yesterday when I had a fridge full of roasted beets, quinoa and parsnips. I made the burger and fries tonight and they were great! The only issue is that the burgers didn’t hold together very well. Next time should I cook them longer? Chill them longer? Not blend as much? Either way, I’m so glad to have found your blog – I can’t wait to try more of your recipes! You want to blend until you have a chunky refried bean texture. Then when you add the remaining beans and quinoa be sure to mix everything really well so it’s all very much sticking together. Roll them together tightly in your hands to form the patties, if they feel too fragile at that stage, I would chill them longer. Let me know how that goes! This is gorgeous! I have made quinoa burgers before, but never with black beans. I am craving this!! i have a tree nut allergy? Could I omit walnuts or will it change the consistency of the burger? Or is there a substitution? thx.. these look delish! Great recipe!!! I made black bean burgers the other month which was delicious but will have to try yours – adding walnuts sounds like a really good idea! Best veggie burger ever! and.. something which is now close to our heart .. its Gluten free. Hi Margaret – I’m so glad you liked them (and managed to flip them!). 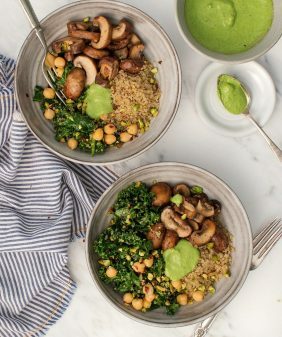 So I’ve had this recipe bookmarked since you posted it earlier this month and I’m currently sitting on a bunch of leftover black beans and quinoa, which makes me think this is the perfect recipe to try out over the weekend! 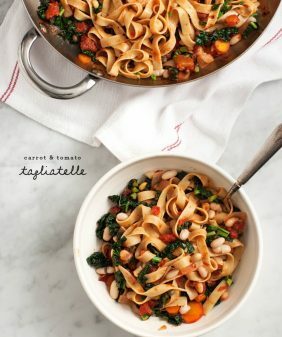 Do you have any suggestions for how to make these ahead of time and freeze, or whether they would freeze well in general? I haven’t tried freezing them yet… (I will at some point because for the effort I’d love to be able to keep some on hand). If you make them one day ahead and chill over night I’m thinking that would actually help their cohesion. If you try freezing them before I get the chance, let me know how it goes? I’ll be making these later today and hopefully thawing them in the near future when the weather is warmer. (Will it ever be warmer?) Because the recipe is vegan, I don’t plan on cooking them at all before I freeze them, but I’ll keep you posted on this adventure! Curious – did anyone try freezing these? Hi there- Silly question: Can I use an actual egg? Don’t happen to have ground flax. Although, I do have chia? Also, can you sub other nuts for the walnuts depending on what you have? Almonds, etc.? yes – you can absolutely use an egg (1 egg should be fine). 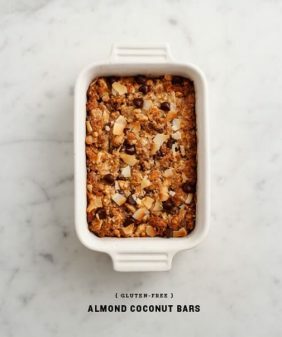 I want to say almonds would work but I haven’t tried them so I can’t say for sure – I would grind them up before adding them to the other ingredients just so they don’t turn out crunchy. I also think ground sunflower seeds would be a nice substitution. I just made these DELICIOUS burgers and they are AWESOME! Very easy to make and didn’t take long at all. I made a few small substitutions because I was totally out of cumin (used fresh parsley, paprika, and montreal seasoning), and I used apple cider vinegar instead of balsamic. My whole family loves them (even my picky eater – he’s 4) and now I have the perfect vegan burger! Thank you! This site rocks, how did it take me so long to find it? I’ll definitely be featuring you in my blog tonight after I eat this?!!! Made these today! Great recipe! Thanks so much!! I’m so glad – thanks for coming back with feedback! I made these last night and they were one of the best! My meat-eating husband said he liked them better than meat and the flavor was amazing. Definitely going into the regular rotation. Thank you! ha – yay, I’m so glad. Thanks for coming back to let me know! These look absolutely delicious! I stumble onto your blog every few months and love it so much every time. I’m finally having the clearheadedness to add it to my bookmarks page so I can visit it more often! Just out of curiosity (and I know someone else mentioned this), have you tried freezing them? I seem to have lots of free time on Sundays, but none throughout the week and would love to be able to munch on these delicious treats anytime I pleased. Thank you so much for your beautiful blog! Oh no! I forgot to chill them! I hope that step wasn’t too important! These were the first black bean burgers I have ever made that were not mush inside. They were just perfect. Loved the flax egg idea. Definately a keeper. I did add a little whizzed Kale and left out the beet. Dried spices were ground, not whole. Wonderful flavor. Thanks for this. I have been searching for a good veggie burger! I just made these last night and they were great. I made them as a slider with slow roasted tomatoes, fried onions and an aioli. Next time I need to make the chipotle mayo. Thanks for sharing! so glad you liked them – sounds delicious with slow roasted tomatoes! I made these last night and oh my, the mayo and ketchup alone were yummy! My mom has recently switched to more of a plant based(sometime’s vegan as you say haha) diet and we both loved these. The only problem I had was trying to flip the patties in the oven, I let them bake for 15 mins and then tried to turn them but they were still mushy so I let them bake the rest of the 10 mins on the same side and it was still a bit mushy. They crumbled when I transferred them to the buns but were definitely cooked all the way. I’m not sure where I messed up but I would love to make these again. Hi Andrea – so glad you liked them! They can be tricky since there’s no egg here… Try adding more flax to help bind them a little more (maybe 2 teaspooons or so)… and/or, try letting them sit longer in the fridge to firm up before you bake them. These are so delicious! This weekend I served the burgers with a poached egg on top for brunch…yum. Hi Carol, so glad you liked them! Thanks for letting me know! Just made this and it was awesome! They held together really well. Hi Rachel – i’m so glad you liked them! These burgers look & sound delicious! I have a tree nut allergy as well so any suggested alternatives for the nuts would be great! Lovely recipe Jeanine! I haven’t tried it (so I can’t say for sure) but I’m thinking sunflower seeds would replace the walnuts just fine. This veggie burger is DELICIOUS! I’ve already made it twice and I definitely will keep making it! I made a Bloody Mary ketchup to eat with it and it’s so awesome! Thanks! Thanks! I’m so glad you like it – how do you make your bloody mary ketchup? I make it with 3/4 cup ketchup, 1/4 cup horseradish, 2 teaspoons hot sauce, 1 teaspoon celery salt and 1/2 teaspoon Worcestershire sauce. It is spicy and delicious! Makes the burger satisfying with some baked french fries to dip into! My husband (who loves his meat) said this was the best veggie burger I have ever made. This is a keeper. I used regular quinoa instead of red quinoa. Always love good, solid veggie burger recipes and I need more in my life! 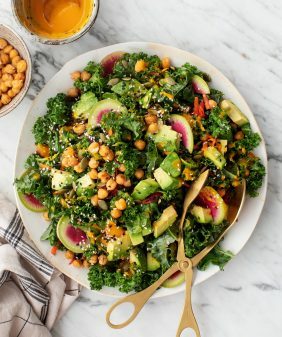 It’s got so many nourishing ingredients so I can’t wait to give it a go! That chipotle mayo sounds about like the most perfect thing. I’ll be dippin oven fries in that! Thank you for this Jeanine! I am a fan of burger and I always make my own burger at home however, with beef and chicken patties. I didn’t know that you can make patties with black beans and walnuts. Should give this a try. I can’t wait to try these!! Thanks for sharing!! Prepped these last night and baked for dinner tonight. INSANE! Flavor was wonderful. I made a chipotle mayo and had the burger with avocado, red onion and argula. I’m in love. Thank you. Definite staple for my summer eating. I love ur recipes. thanks Danielle – I’m so glad you liked them! I decided to do a search, to find the perfect veggie burger recipe…well, i search no more! these are great, and all basic ingredients in my pantry…going to make a double batch now, and freeze for summer fun!!! I am a HUGE traditional burger fan, but after having to switch my diet earlier in the year to a more friendly paleo/glycemic diet (I.e. Beef is pretty much a ‘no’ for me in any shape or form, as to keep my hormone issues in check) I’ve tried so many bean burger alternatives to make – and I finally I found one that stuck together (yay!) – and tasted amazing! *Just as a side note for my go at the recipe: I didn’t have walnuts on hand, but I used almond meal as a substitute; and I used an egg rather than the flax egg. Both substitutions seemed to hold up. But I’d imagine if you were to stick to the recipe as is, it would still be great! Also, my oven heats up quickly, so instead of pre-heating at the beginning, I pre-heated while the firmed patties were resting in the fridge and I found that to be a-ok in my case. Thank you again for the great recipe, and I’ll definitely be trying some more from your beautiful site! Cheers! Thanks Kristen, I’m so glad you liked them! Thanks for listing your alterations too, I’m so glad you were able to use what you had on hand! I think I might be allergic to quinoa. 😢 Do u know of a good substitute for quinoa? 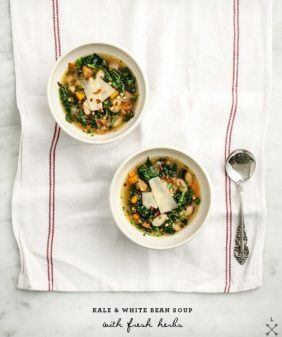 Cuz I’d love to try this recipe! !